If you're a starving artist, apparently one solution is to build your home eight feet off the ground. If you're interested in becoming an indie game designer, there's one warning you'll frequently hear: You shouldn't be doing it for the money. While there certainly are success stories, developers usually face a starving artist period until they can make a living from the craft (if at all), so certain sacrifices have to be made. For some, that means getting a second job or not buying that house you wanted. For Alix Stolzer and Calvin Goble, the husband and wife team behind Legend of Dungeon, that meant moving into a self-designed treehouse that met all their personal needs. Although when you think about it, designing videogames in a treehouse with your spouse sounds less like "sacrifice" and more like "marriage as imagined by six-year olds". "While money was coming in from our games, it really wasn't enough to pay the bills," Stolzer told Joystiq. Instead of juggling between a day job and developer's duties, the pair moved to a mountainside forest in Vermont, where they built a spacious looking treehouse that allowed them to live on $150 a month plus food expenses. Thanks to solar panels and a convenient location within cellular internet coverage, Stolzer and Goble were even able to continue producing games. 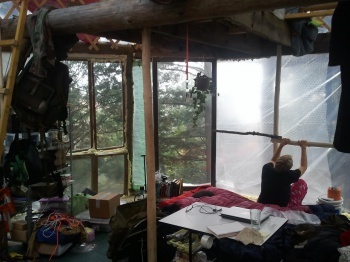 "We sold our house and used as little money as possible to build a small house-tent thing eight feet off the ground, on a platform our friend had made out of four trees," Stolzer continued. "We spent maybe $1,000 on it, really using thrifty things like greenhouse plastic, and making our own solar panels, etc. It's an awesome adventure, but the downside is it slows down game development." Legend of Dungeon's Kickstarter provided more than enough income to switch to full-time development, but Stolzer and Goble still technically haven't moved out. While staying with family until the game is finished, both partners are more focused on conventions like PAX East, and enjoying how well Legend's beta has been received. Despite their success, Stolzer and Goble still haven't forgotten the circumstances that led them to move eight feet off the ground. "I would say to anyone looking to save money: Look at your absolute basic necessary living requirements and meet them," Stolzer said. "The rest is bonus, and it's up to you if you want to pay for them or not. That doesn't mean you have to live in the woods, but you also don't have to live like everyone else."